Staircases are often overlooked as simply functional items in the house that allow us to get from one floor to the next. However, as we are going to discover today, a staircase can double up as a design element in the home—and then some! Staircases have the ability to become the focal point of a room, bringing innovation and creativity to even the most plain and simple homes. Today, we are going to explore 13 incredible staircases that you'll have to see to believe. Are you ready? This design is incredibly modern and innovative, with white stairs making their way up to the second floor, seemingly floating in mid-air. The white stairs contrast beautifully with the black wall and stone cladding, packing even more of a punch. 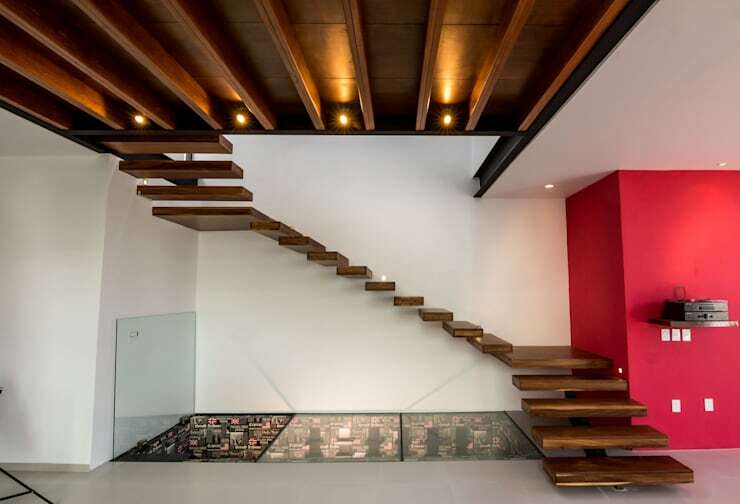 Can you see how the staircase completely enhances the home? 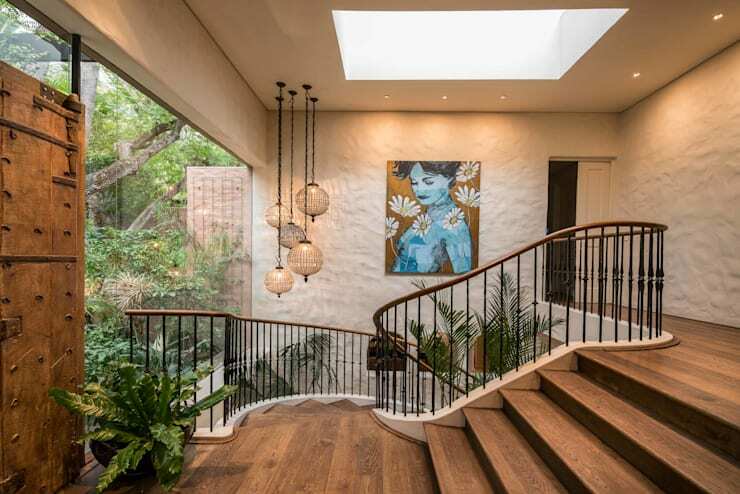 In this design, we can see how natural light and the introduction of plants and flowers completely enhances the wooden staircase. Opt for large glass windows and doors as well as skylights, which will bask your staircase in natural light. Adding plants or flowers to the space instantly connects it to nature. 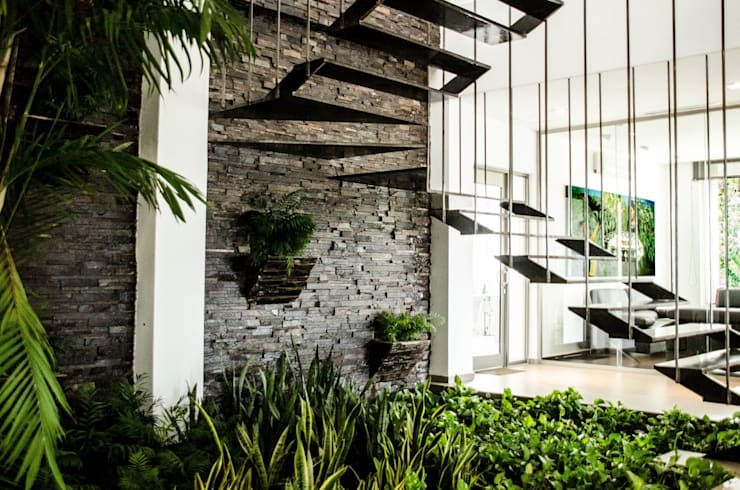 Have a look at these tips for decorating your staircase with a garden. 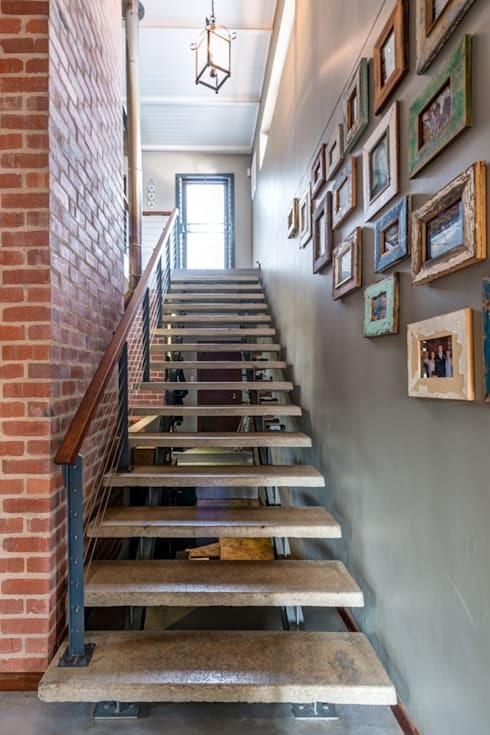 Don't be afraid to get creative with your staircase, bringing in more industrial or eclectic design elements. 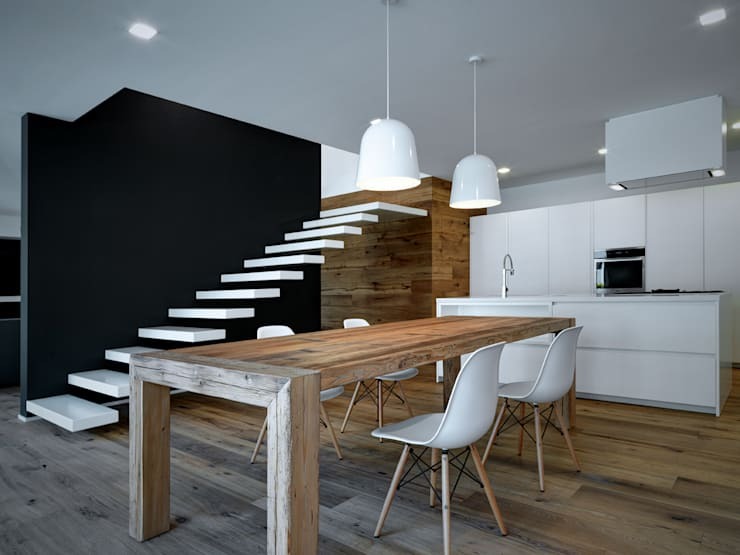 In this image, we can see how the chunky yet lightweight metal stairs create a very unique arc through the horizontal plane, resulting in a chic and cutting-edge style of staircase. Functionality has never looked so good! Your staircase can also can go a more classic route! Opt for neutral tones such as white or beige and incorporate very elegant materials such as marble or granite. In this design, we can see how the stairs sweep down in a curve from the second floor. 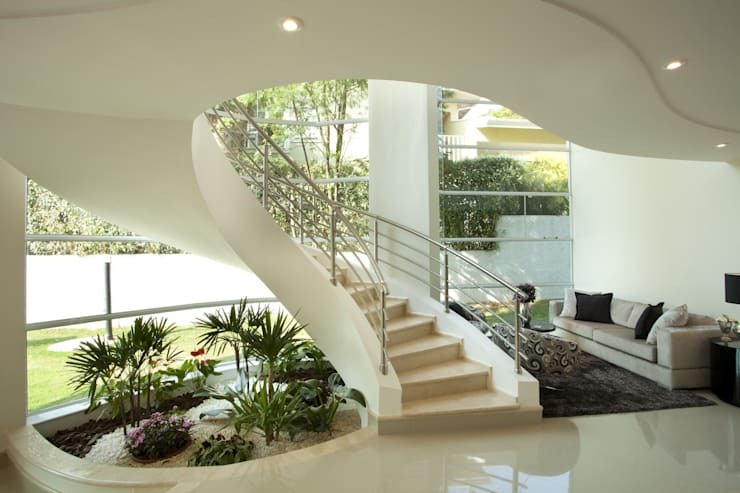 The curves soften the effect of the staircase, while the steel banisters are the cherry on top of this stylish feature. Don't be afraid to go for dark colours when it comes to your staircase design. 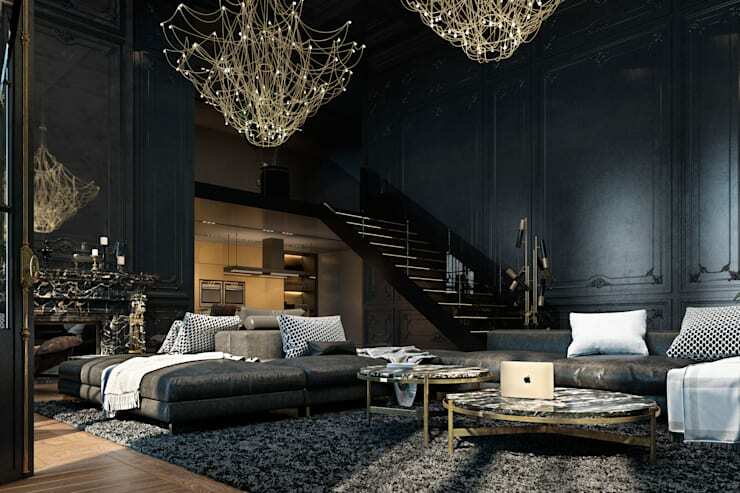 Darker tones such as midnight blue or charcoal black can introduce a very lavish and luxurious look and feel to your home. If you do go this route, just ensure that you have adequate lighting so you can see where you are going when you move up and down the stairs! 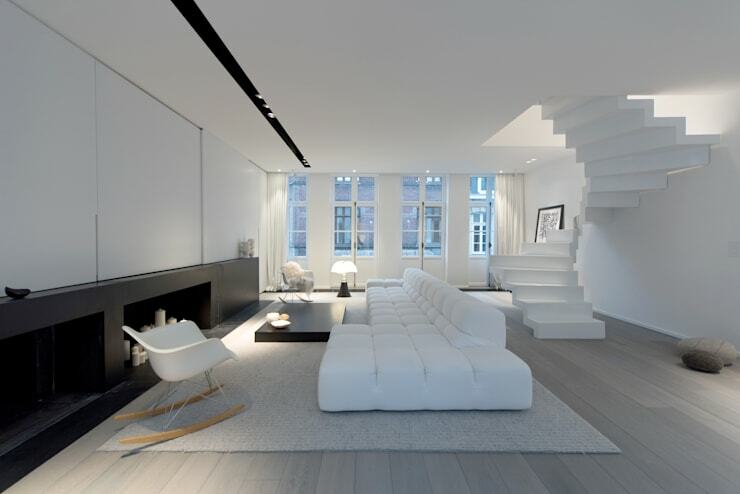 If darker tones aren't for you, don't be afraid to go for a sleek and minimalist white! In this image, we can see how a pure white staircase accentuates the shape and style, while remaining elegant and understated. It also works with any decor scheme! Have you ever seen something quite so innovative and chic? 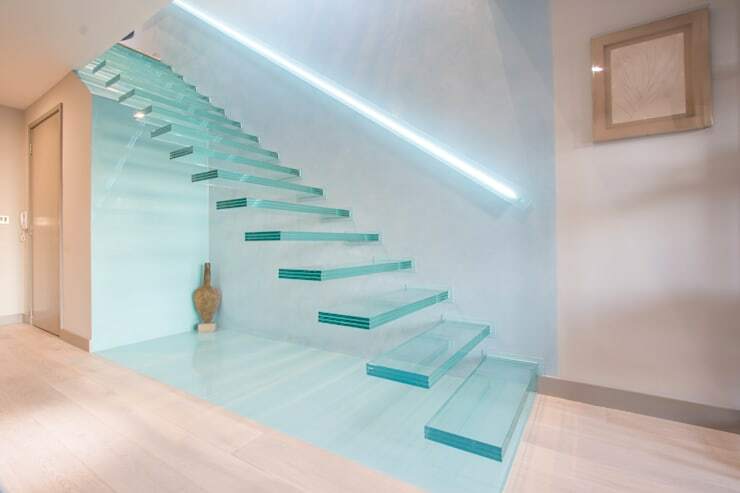 These glass stairs are a very stylish, trendy and unique play on the traditional staircase, but they also take up very little space both visually and physically. 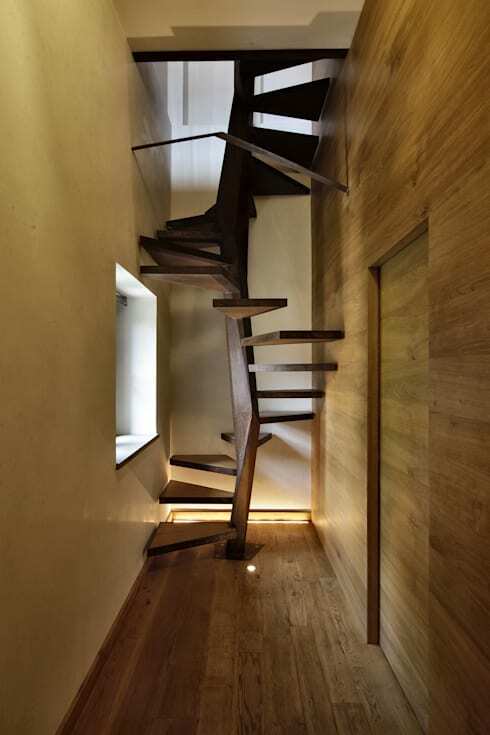 If you don't have that much room for a staircase, this is a great option! Create a centre piece for you staircase so that every time you walk up and down it, you are entranced. 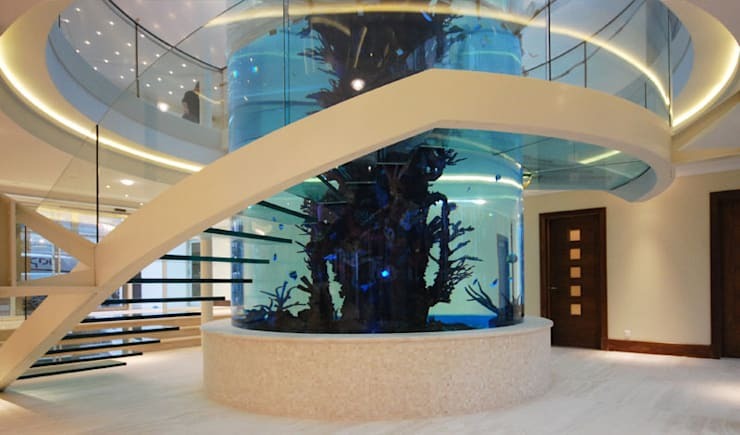 In this design, the professionals have built a two-storey high aquarium, which changes the whole look and feel of the staircase. You'll never get bored climbing the stairs! Remember that your staircase doesn't need to be limited to the inside of the home—stairs work great outside too! 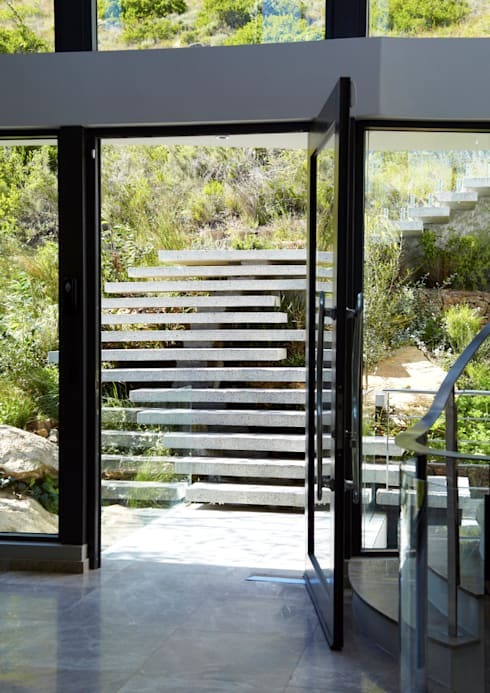 In this image, we can see how a staircase creates a beautiful flow between the interior space and the garden area, allowing for visitors and family to travel down through the garden to get to the front door, which is made of glass. Use your staircase to introduce personal elements into the space, which bring charm and a sense of homeliness to the party. Picture frames, family photographs and artwork can be hung on the walls next to your stairs, not only giving people something interesting to look at between the bottom floor and the second floor, but also breathing life and soul into the home. You don't have to go for the same boring shapes and sizes when it comes to your staircase. This staircase looks like it has been inspired by a tree design, resulting in a very unique and refreshing look and feel. We've seen how beautiful a floating staircase can be, but don't forget how impressive simple wood can be for your stair design! Wood is natural and warm, bringing a very homely touch to a space. Don't forget that your staircase can be more functional than simply getting you from one part of the house to the next! 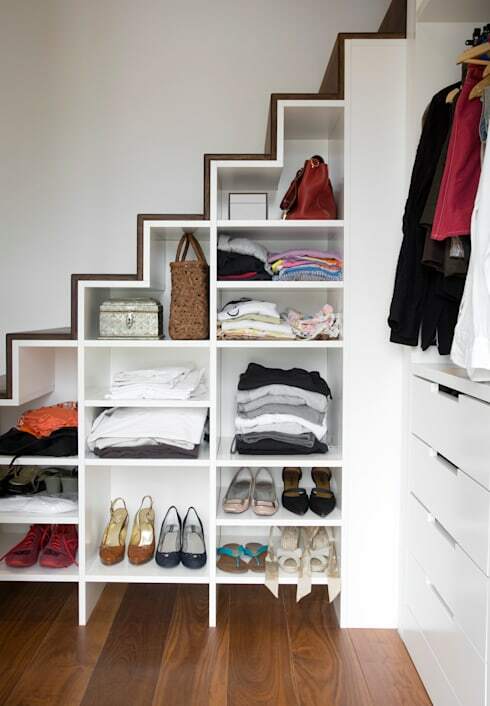 In this image, we can see how the underneath of the staircase has been completely utilised for storage space! Shelves have been neatly installed, allowing it to double up as a cupboard. Don't waste the space under your stairs! Which staircase was your favourite?